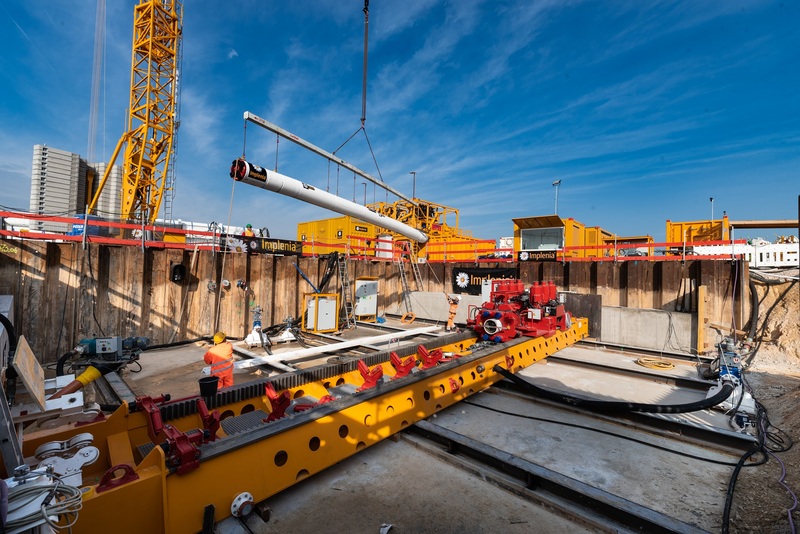 With E-Power Pipe, Herrenknecht has developed a new method to quickly and securely install small-diameter cable protection pipes underground over long distances of more than a kilometer. The innovative method has purposefully modified and further developed proven drilling technologies so that in the future, underground cables can be installed trenchlessly and close to the surface at a depth of between 2 and 4 m with minimal intervention in the landscape. The tunneling machine is equipped with a jet pump and an integrated hydraulic power unit. With conventional methods, space restrictions limited muck removal over longer sections and as a result also limited the drive lengths possible. Through the use of the jet pump for transporting the muck, up to 10 times longer tunneling distances can be realized at high speeds in the small diameter range. At the starting point, a newly developed push and pull unit is installed and its thrust is used to push the jacking pipes and the TBM along the specified route in the direction of the target point. The borehole remains securely supported by the machine and the jacking pipes the whole time. After breakthrough at the target point, the TBM is separated from the jacking pipes. Subsequently, the prefabricated cable protection pipe is connected to the jacking pipes still located in the borehole and pulled back and thus into the borehole by the push and pull unit in the launch shaft at the other end. After installation of the protection pipe, the E-Power Pipe mission is complete. Final insertion of the underground cables is carried out by appropriately specialized companies. The method innovation involved the development of new, extended jacking pipes that allow a much more continuous advance. Herrenknecht developed an appropriate push and pull unit with a 10-m stroke and a push and pull force of 350 tonnes specifically for these jacking pipes. The technology is based on a rack and pinion guide, powered by electric motors. As a result, the innovative concept ensures higher installation performance and greater acceptance thanks to lower noise emissions. The efficiency of E-Power Pipe has already been successfully demonstrated in pilot projects. Daily best performances were achieved of 184 m during tunneling and 266 m when the protective pipe was pulled in. The development of the method received funding from the Federal Ministry of Economics and Energy (BMWi research project IBoTec) and was carried out by Herrenknecht in cooperation with Amprion GmbH and with RWTH Aachen. alternative to the conventional open-cut method. 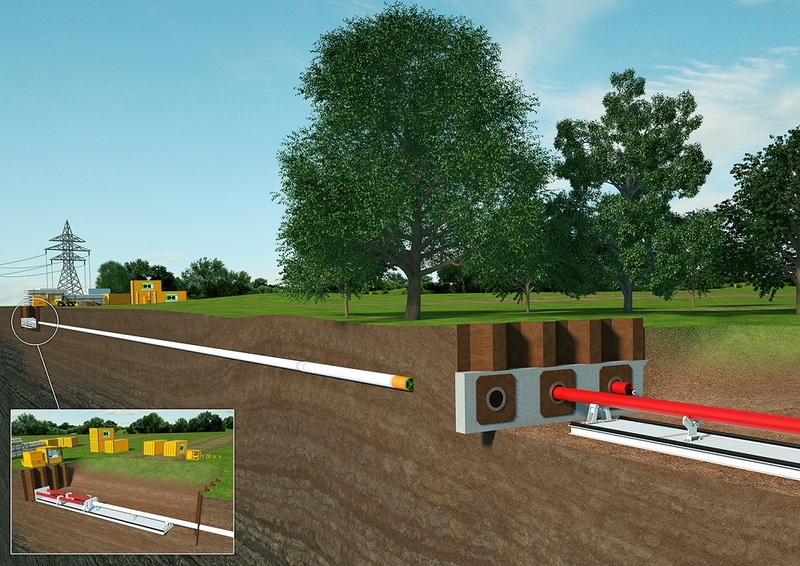 Due to the trenchless installation method, earth movements are reduced at the places where HVDC cables have to be connected later. This can mean a reduction of about 90 percent in relation to the entire alignment. Installation takes place without any environmental impact over long distances, since the surfaces and the soil structure are left largely untouched. The use of construction machinery and trucks is also significantly reduced in this way,as are noise and emissions. As part of the planned grid expansion with total investments of approximately 50 billion euros (including offshore grid connections), there is a need in Germany for 3,050 km of grid reinforcement on existing lines and around 2,400 km of new high-voltage direct current transmission lines, which are primarily to be installed as underground cables. With the environmentally friendly installation of efficient power lines, local residents and property owners can be relieved, social acceptance can be increased and approval procedures can be accelerated. The method has been nominated for the bauma Innovation Award 2019 in the “Machine” category. This is awarded in mid-April in five categories. A panel of experts evaluates the practical relevance, economic potential and contribution to environmental protection of the innovations. The award is jointly conferred and awarded in five categories by the VDMA (German Mechanical Engineering Industry Association), bauma and the umbrella organizations of the German construction industry, HDB (German Construction Industry Federation), ZDB (German Construction Federation) and BBS (German Building Materials Association).